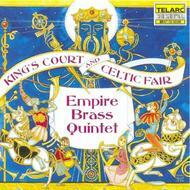 'King's Court & Celtic Fair' is an enchanting collection of works that explores the two musical worlds of old Europe in new arrangements featuring the use of electronic percussion. Flavoured by the proud traditions of Scotland (complete with bagpipes), the Empire Brass Quintet and friends musically capture the lighthearted merriment of a peasant Renaissance fair and give upbeat performances of court music of the 16th, 17th and 18th centuries. Selections from this recording include a haunting bagpipe rendition of Amazing Grace, Hamelin Gigue, Sarabande, and music of Byrd, Scarlatti, Purcell and Rameau from the European Renaissance. This music, with its lively and infectious rhythms, transports the listener to the land of magic, joy and fun. The release closes with a bonus track titled Joy, an original arrangement based on Ode to Joy by Ludwig van Beethoven.